Similar to Our Lady of Manaoag Shrine in Pangasinan, Our Lady of Peace and Good Voyage in Antipolo City attracts pilgrims from all over the country particularly people intending to travel, work abroad or blessing new cars/vehicles. 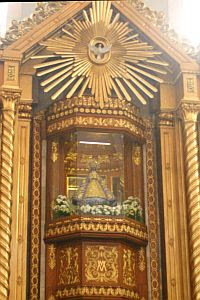 This belief in Our Lady of Peace and Good Voyage (Nuestra Senora De la Paz Y Buen Viaje) has its roots, historians say, that the miraculous icon has sailed back and forth between Manila and Acapulco (Mexico) eight times and on several occasions was credited with protecting the galleon from pirates, and Dutch/British blockades. 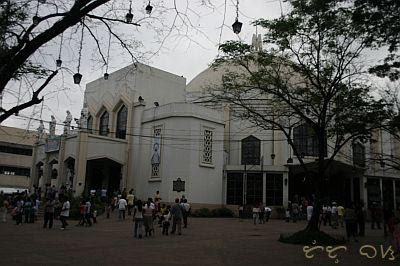 picture of Antipolo Church. too bad the sky turned cloudy just as Tutubi passed by. Fiesta in Antipolo is during the month of May while mass schedules follow the usual Sunday masses. For those who want to have their cars and vehicles blessed, proceed directly to the Parish office to make your donation (of any amount) then show your receipt to the priests and lay ministers blessing other vehicles. The process takes only a few minutes. People and vendors may sell you pasalubong like suman, kasuy (cashew nuts, mostly from Palawan) and others but buy from the legitimate vendors on a certain side of the church. The ambulant vendors are illegal and block the gates and passageways. Overeager people may also pin something on you on your way out of the church, politely tell them you're not interested for they' ask for donation again which are not sanctioned by the parish. Commute: the fastest way is via MRT/LRT transfer to LRT 2 get off at the last station (Santolan). Board a jeep bound for Antipolo then transfer to a tricycle to take you to the church. There are Antipolo-bound jeepneys in Cubao, Quezon City. Commute from Laguna: Board a Sta. Cruz-bound jeepney then transfer to a Siniloan PUJ. In Siniloan, flag a jeep to Tanay, Rizal then another jeep to Antipolo (too many jumps but faster than going around the Laguna Loop. If you're from Quezon province, you may board a jeep bound to Pagsanjan or Sta. Cruz then follow this route. Divisoria, Manila to Antipolo, take EMBC bus that pass by Sta Mesa and Ortigas Extension. Take tricycle to Antipolo Church. Boso-Boso Church: remnants of an old church destroyed during World War 2. Inday Nelly's Mystical Cave located in Puting Bato, Brgy. San Luis, with 205 step stairway, with natural rock formations (stalactites and stalagmites) resembling Catholic images. My friends and I went there once and unfortunately the experience was all a blur. I could not remember any single thing, except that vendors keep pinning us with medallions that eventually pushed my friend's button and yelled at these vendors to stop we are not buying. Last Sunday, I was in Caleruega. T'was a nice church. I love to travel so thank you for your blog, it's very informative! I linked u up. your posts are very timely tutubi as we're nearing the holy week. thanks for sharing! There were also sellers who overcharge like the one who sold me ceramic image of our lady of good voyage at P150, which can be seemingly bought at P30. Felt I was too gullible that time but just thought of it as help to the vendor. to tutubi:nope, taga-GMA, Cavite po ako. Pala-Pala kasi ang pinakamalapit na way eh. Ikaw po ba ay taga-saan? And thanks for the link-up! ferdz, it's always the first church of the so called "laguna loop"
orange, those pesky vendors agai, heh? Wow, good timing, the altar is similar to Ate Ghee's shot. So its the same place. :D I'm not a catholic so I'm not exposed to catholic churches but I like their structures, as what I've seen in pictures. It's so big inside. Off topic; I've been trying to RSS your site but it does not work. Perhaps you can do me a favor by checking the feed? I've said it before and I'll say it again: religion really seems to be taken seriously in the Philippines. Hi! This is Jen from Living Asia Channel. 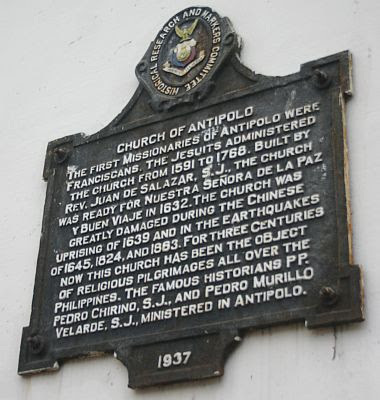 Just want to ask permission if we can use the Antipolo Church image for our future project. We will surely give acknowledgement. Kindly contact me at living_asia_channel@yahoo.com or call me at 09182409136 / 09151784038 if this meets your approval. Thank you so much and have a good day!